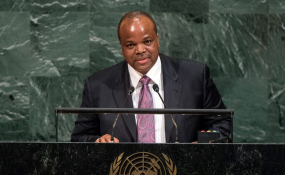 King Mswati III of Swaziland addresses the general debate of the General Assembly’s seventy-second session (file photo). King Mswati III, the absolute monarch of Swaziland / Eswatini, told a meeting of the kingdom's 'People's Parliament' he had been visited by angels whom told him who he should appoint as the kingdom's new Prime Minister. The Times added, 'He said it became apparent as he was continuously in prayer that the angels and ancestors (tingilozi nemadloti) would appear to him and show him the right man for the job. In 2013, African Eye News Service reported King Mswati's elder brother, Prince Masitsela Dlamini, said that God had given the royal family authority to rule over other Swazi clans. 'The Dlaminis are closer to God,' said Dlamini. In 2011, the King said God spoke to him through a TV remote control. It happened at the Lozitha Palace, near Mbabane. At the time the King told his subjects about his 'miraculous experience'. The Times of Swaziland reported in October 2011, 'His Majesty saw a miracle yesterday when he was preparing a sermon [to preach to a group of evangelical Christians.] The King said a remote control lay at the centre of a coffee table but something mysteriously brought it down. On 21 October 2009, the Swazi Observer, a newspaper in effect owned by the King, told its readers King Mswati was 'ordained by God to lead his people'. Musa Ndlangamandla, the Observer chief editor at the time, reported that Lutfo Dlamini, then Swaziland's Minister of Foreign Affairs and Cooperation, wrote a poem to the King that included the line, 'You are living proof that Kings and Monarchs are ordained by God to lead his people'. Following this, the most senior 'traditionalist' leader in Swaziland Timothy Velabo Mtsetfwa was reported in the Observer saying 'Royalty was a gift from God'. He said this while urging the Swazi nation 'to respect the Royalty because it cares for the needy'. Mtsetfwa also spoke about how multi-parties which are banned in Swaziland, 'were a monster to which many countries had succumbed and fell'. He then went on to say, 'in other countries, especially those under multi-party democracy, the leaders only think of themselves and their immediate families and forget about the needy people'.